If you’re an avid reader of All Things Holic (there might be someone out there who fits under this description…maybe? seriously, does anyone want to step up and be a Holic-aholic? 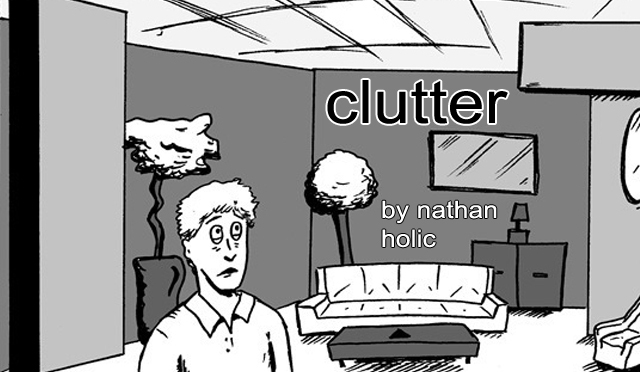 ), you might have noticed that my serialized graphic novel “Clutter” went on hiatus sometime last Fall. It’s okay. Don’t worry. The project wasn’t abandoned. The publication, Smalldoggies Magazine, just underwent a major renovation (<—-that’s a metaphor that seems to fit within the world of “Clutter”). Actually, it might be more accurate to say that Smalldoggies Magazine was demolished so that a new building could take its place. Matty Byloos, the co-founder of the magazine, created a new online publication called Nailed Magazine; all of the content from the old magazine was transferred over, and now they’re starting to publish new material. So anyway. “Clutter” has just resumed. It feels a little weird to pick up the pencil and pen again after so much time off, and it will likely feel weird to read this single new installment of the series (since it takes place within the very short time span of the overall series, and assumes that you just finished reading Part 13), but hopefully that weirdness doesn’t last. Get set for more “Clutter” soon. Until then, maybe it’s time to get a refresher, and to reread some of those old installments, right? Just click on “Publications” on the menu bar up there, and then “Graphic Narratives,” and there are links to every single episode. This entry was posted in Writing Updates and Links and tagged Clutter, Nailed Magazine, Nathan Holic. Bookmark the permalink.